Football season is here, and whether your preference is college or pro, the Capitol Corridor has your transportation covered, from the preseason “warm-up” games of summer, to the colder winter match-ups. Of the Capitol Corridor’s 18 stations, four of them provide service to Northern California’s major sporting venues! Read our guide to travelling by train to see the Oakland Raiders, San Francisco 49ers, and Cal Bears in action this season. In addition to hosting the Oakland Athletics professional baseball team, the Oakland Alameda Coliseum is home to the NFL Oakland Raiders. During the 2018 season, fans can take advantage of a 25% discount on the Capitol Corridor to all Raiders’ home games, including pre-season match-ups! LATER TRAIN FOR 9/10 GAME! In addition to game-day savings, we’ll be delaying the schedule for Train 550 for the Monday night game on September 10. Train 550 will depart at 10:45pm instead of 10pm to accommodate fans! Getting there: The Oakland Alameda Coliseum is an easy 4-minute walk (0.1 miles) from the Oakland Coliseum Station. For more info, visit: www.coliseum.com. Levi’s® Stadium is known for being the most high-tech stadium in the world and is home to the NFL San Francisco 49er’s football team and adjoining 49er’s museum. In 2016, the Santa Clara stadium even hosted Super Bowl 50! LATER TRAIN FOR 11/1 GAME! To accommodate fans attending the game on Thursday, November 1, we’ll be delaying the schedule for Train 548. Train 548 will depart the Santa Clara-Great America Station at 8:45pm instead of 7:28pm. Getting there: Levi’s Stadium is an easy 5-minute walk (0.3 miles) from the Santa Clara/Great America Station. For more info, please visit: www.levisstadium.com. 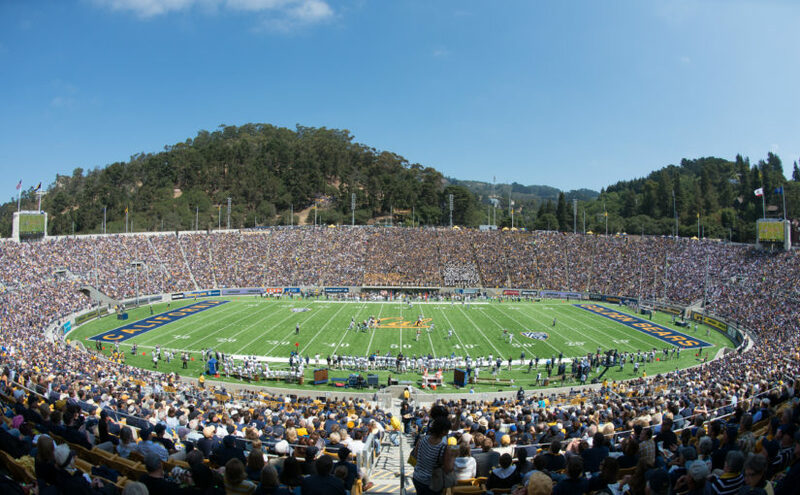 Kabam Field at California Memorial Stadium is the home of the University of California Berkeley’s Golden Bears since its opening in the fall of 1923. Getting there: From the Capitol Corridor Berkeley Station, take AC Transit’s Line 51B to the stop at Durant and Telegraph. Or, take the Capitol Corridor to the Richmond or Oakland Coliseum stations and connect with BART to the downtown Berkeley BART station. For more info, visit: www.calbears.com. Visit the Sports & Entertainment page of our website for a complete list of sports and entertainment venues served by the Capitol Corridor in Northern California. Previous Previous post: Win tickets to San Jose Jazz Summer Fest! Next Next post: WIN Tickets to CA Craft Beer Summit!